January 4, 2019 Robert W.
Sign stores that make banner stands are in high demand during the busy convention season in Nevada. 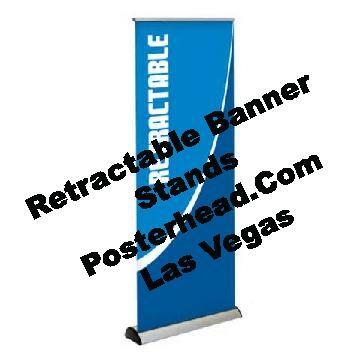 Banner stands are the favorite display graphic that is displayed at conventions and trade shows that attract millions of visitors to Southern Nevada during January through April. The biggest conventions choose to come to Las Vegas for their show because of the state of the art convention facilities that are located here. Besides top notch venues, Las Vegas has the hotel room capacity, restaurants and many other amenities to keep the millions of visitors busy during their shows. Sign stores that make banner stands can make many different sized retractable banner stands. 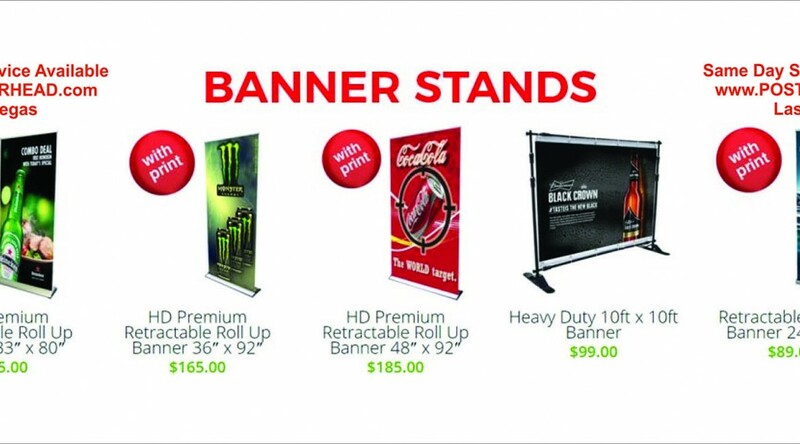 One of the most common sizes is the 33″ x 80″ banner stand. While the size may vary an inch or two either way, this is predominantly the most used banner stand at events. Perhaps it is because it is so easy to set up and travel with. Banner stands range from around two feet wide all the way up to about 5 feet wide and come in economy and deluxe versions ( The deluxe versions having a wide chrome base that looks impressive) The prices for these banner stands range from under one hundred dollars to below two hundred dollars. This would include the stand, carrying case and print. Sign stores that make banner stands can do it very quick. The average turnaround time is just a day or two but incases of emergency, the sign store can make it the same day. This is important for people at trade shows and conventions because often signs and banners get damaged or turn up missing and need to be replaced quickly. Since the design has already been done, its just a matter of printing the new banner graphic and placing into a banner stand. The hard work of designing has already been done. December 28, 2018 Robert W.
Trade show signage and banner stands is BIG Business during the trade show season in Las Vegas. Millions of attendees come to Las Vegas for these events and thousands of vendors come to Las Vegas to present at the many trade shows and conventions. Las Vegas hosts the biggest and best trade shows and conventions in the world. Las Vegas has world class state of the art venues that have over 1 million square feet of floor space that can be divided up to host several conventions at the same time. The companies and vendors love coming to Vegas because of our year round good weather ( moderate climate here while most of the country is knee deep in freezing snow ! ) Also, after the conventions, attendees and participants have the opportunity to have so much fun through the amenities that Las Vegas offers. Trade show signage and banner stands can be made quickly and efficiently in Las Vegas because many sign stores service the trade show industry. Las Vegas Sign stores realize that time is of the essence and that when a company is in town for a show or event, they need there signs in a hurry and a priority is given to those companies that need same day signage. The speed of making signs and banners has dramatically increased over the years because of the modernization of printers that allow for faster printing. The newer printers can print well over two hundred square feet of material an hour, which has resulted in lower production costs that get passed on to the consumer. Trade show signage and banner stands have never been easier and faster to make than ever before. There are sign stores all over the Las Vegas valley that can assist you in getting your trade show and banner stands. The shops that cater to the industry are generally located near the conventions and trade show venues. December 16, 2018 Robert W.
Trade show signs made fast in Vegas is great when you find yourself at a trade show without your signs. Often, signs that are shipped find themselves at a different location than intended or backlogged because bad weather has temporarily halted shipping. In other times, your signs and banners get damaged while in transit. In all these cases, you need to find a local Las Vegas sign store that can replace these graphic displays fast and inexpensively so that the show can go on. Trade show signs made fast is just that, quickly same day signage. Local sign stores in Las Vegas are use to handling emergency type signage for the trade shows and conventions. These shows attract millions of attendees and thousands of vendors. A small percentage of these vendors find themselves in need of fast signs because of shipping issues. It is not only just shipping issues, many companies change out their graphic at the last minute to take advantage of their competition or just update their marketing strategy to reflect a change in the business environment. Sign stores have purchased the latest model printers for printing of signs that can print banners, banner stands and signs faster and cheaper than ever before. These modern day printing marvels utilize the eight color ink system that can mix and match inks better than ever before to get just the right color shading and tone. Also, these large printers can print at very fast speeds, often exceeding two hundred square feet per hour. These advances of technology in the sign world have actually lowered the cost of printing because of the speed of the machines and have lowered manpower costs. trade show signs fast can be found at sign stores that cater and service the trade show industry. They are generally located near the convention venues. December 13, 2018 Robert W.
Cheapest trade show printing in Vegas is great when you are looking for affordable sign and banner printing for your event. Trade shows and events are a big thing in Las Vegas because we host so many of them. It seems that everybody wants to come to Las Vegas for the excuse of attending a trade show, but in reality, Las Vegas is a playground for adults. ( In recent years, Las Vegas has become so much more family friendly that many trade show attendees bring their families with them as sort of a mini vacation). Besides the trade shows during the days, there is 24 hour drinking and gambling along with all sorts of entertainment. Cheapest trade show printing can get you those signs, banners and banner stands at great pricing. Las Vegas hosts many events and many sign companies have started business in Las Vegas to answer the call. These sign stores are hungry for your business and offer discount printing of signs and very often same day printing to accommodate the vendors at these events. 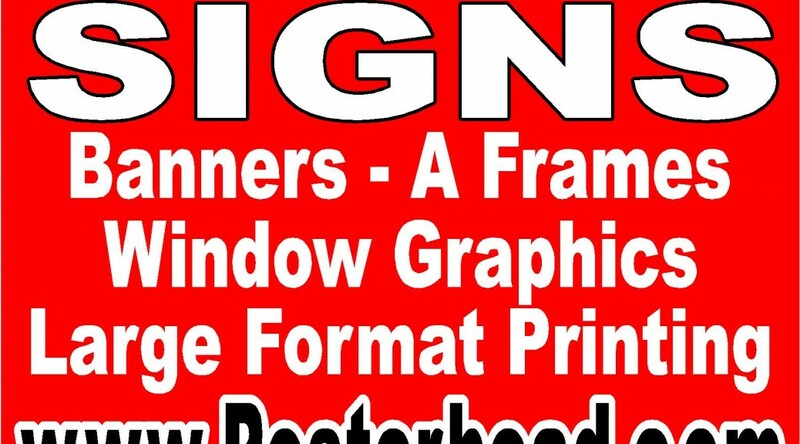 These sign companies have state of the art sign making equipment like wide format printers. plotters, and all other sorts of equipment to make signs and banners quickly. In fact, the modern wide format printers are capable of printing several hundred square feet of vinyl or banner an hour with great quality. The newer wide format printers use the 8 color system that mixes and matches inks to make those prints come alive like never before. The wide array and depth of colors have never been greater with the help of these wide format printers. Cheapest trade show printing is available at many of the sign stores that service the trade shows in Vegas. They generally are located near the trade show and event venues. December 12, 2018 Robert W.
Fast Stand up banner printing in Vegas is available for trade shows and events. Las Vegas is host to hundreds of events and shows yearly that are conducted at the three big convention venues, but there are also events and shows held daily in the private meeting rooms of the Las Vegas strip hotels and casinos. Each of these casinos has thousands of square feet of meeting space that continually hold an array of events and shows. While not as large as a convention venue, they are able to handle thousands of people who attend these events. These smaller venues require much signage in the form of foam boards, banner stands, and other types of signage. Fast stand up banner printing can get you those stand up banners made in many different sizes. The most widely used stand up banner is the 33″ wide model that stands 78″ tall and has an adjustable pole for the height so that if your banner graphic is only 75″ tall, you can shrink the height to that perfect size without requiring a bleed at the bottom. Fast stand up banner stands come in many other sizes ranging from around 2 feet wide all the way up to around 5 feet wide. Fast stand up banner printing is just that, fast and easy. These stand up banners can be made the same day in many cases by professional sign shops that have the necessary sign making equipment. While there are many sign shops in Las Vegas, make sure you choose one that does have equipment versus the sign shops that have to sublet out their signs. Many sign brokers leave there clients crying when their signs are not ready as promised and the sign broker quits answering the telephone. 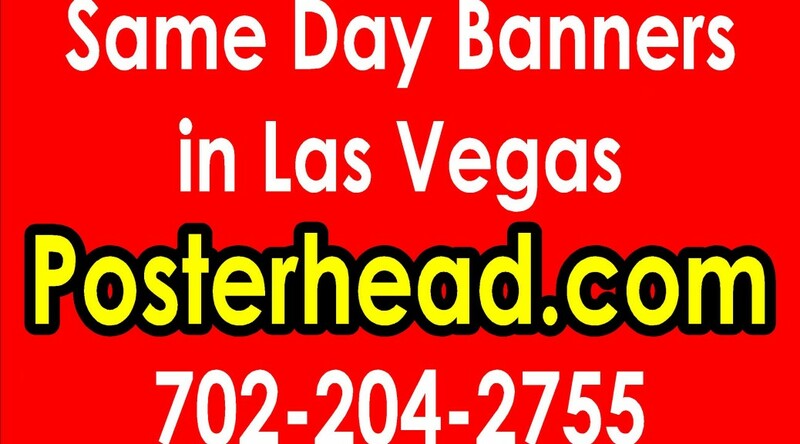 Fast stand up banner printing is available at Las Vegas sign stores. December 10, 2018 Robert W.
Trade Show sign printers in Vegas is a great search term when you are looking for sign printers for the trade shows. There are literally so many trade shows in Las Vegas that it is hard to keep track of them . These trade shows are held at many different locations and attract millions of dollars to the local economy. Trade show sign printers can get those signs and banners printed quickly and professionally in Las Vegas at great prices. Las Vegas has sign companies that have modern sign making hardware that makes those signs faster and cheaper than ever before. The wide format printer is one of those tools that can print cheaper and faster than ever before with great quality. These state of the art printers are using multiple colors to mix and match inks to make colors brighter and more vivid than ever before. Trade show sign printers can make those banners and signs in advance and arrange for delivery to your hotel. In addition, many sign stores can print those signs the same day. Sign stores are use to the many conventions and trade shows that occur everyday and understand that misunderstandings take place and the banners and signs need to be replaced quickly. Often, display graphics will accidently get shipped to the wrong location or show up damaged, causing panic with the vendor because the show cannot be postponed and they have no time to call the graphic store where they had the graphics originally printed and have them remade in time. In Las Vegas, sign stores are accustomed to same day requests during the busy trade show season and try to accommodate those last minute and rush sign orders. Contact a sign store today if you should find yourself in need of same day graphics or just regular trade show sign printing. Convention roll up banners are one of the most popular display graphics at the convention venues. These low cost retractable roll up banners are great for displaying at the shows because of their affordability and portability. Convention roll up banners are self standing, meaning that they require no support because the stand can stand alone, which makes them very valuable in the sense you can place them anywhere in your display booth for optimum viewing. Convention roll up banners are also low cost, with the most popular size , the 33″ wide model selling for under one hundred dollars at many sign stores in Las Vegas. These stand up banners come with a carrying case, full print graphic and an adjustable pole that allows for height adjustment of the graphic in case the graphic is not the full height of the stand ( http://posterhead.com/banners/banner-stands/retractable-roll-up-banner-33-x-78/ ) These graphic display are also very large, capable of about 17 square feet of print and pictures to market your products. Convention roll up banners are made every day in Las Vegas because of the numerous conventions and events that happen daily in Las Vegas. In addition, many convention vendors prefer to have their graphics and signs made in Las Vegas to avoid costly shipping and storage fees that the hotels and venues charge. Also, since market conditions are constantly changing depending on the business environment and competition, last minute banner stands are necessary. Fortunately, many sign shops in Las Vegas have state of the art large format printers capable of printing very quickly and at great quality. These sign stores can be generally located near the convention venues for easy access and easy delivery, in which many of the sign shops offer their clients. After all, who wants the hassle of leaving a comfortable hotel or convention venue to have to go pick up and then try to park again. December 9, 2018 Robert W.
Trade show banner stand display printing in Vegas is very popular during the trade show and convention season in Las Vegas. This period of December through April attract thousands of businesses and vendors to display their goods and services to millions of attendees. Everyday it seems there is a show or event being held at the three big convention venues or one of the meeting rooms at the Las Vegas hotels and casinos. While most people don’t know this, but the hotels and casinos on Las Vegas Blvd ( also known as the Las Vegas Strip ) have hundreds of thousands of square feet of meeting space where smaller conventions and events take place. Trade show banner stand display printing is very cost effective to have made in Las Vegas. 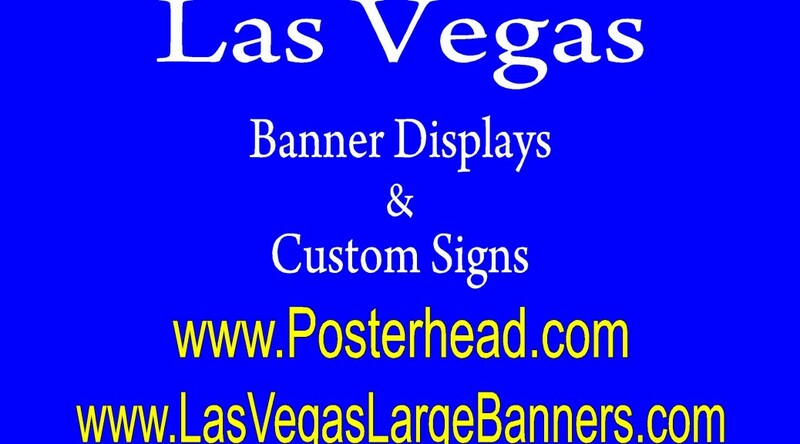 Las Vegas sign stores are well suited to print and make banner stands, retractable banners, stand up banner stands, etc. because we make so many of these stands in Las Vegas. Las Vegas area sign companies have the latest sign making equipment to make those banner stands quickly and with quality with the latest printers that print with amazing colors that are bright and vivid. Trade show banner stand display printing can be cheap in price and made quickly. The most popular retractable banner stand cost less than one hundred dollars and there are many other banner stand sizes to choose from. Trade show banner stand display can be made the same day in cases of emergency, where you need that banner stand replaced because it was damaged or lost or even possibly upgraded because of the changes in the business environment. Local sign shops are capable of printing and assembling you banner stand in a hurry. Contact a local sign store if you find yourself in need of a same day trade show banner stand display.